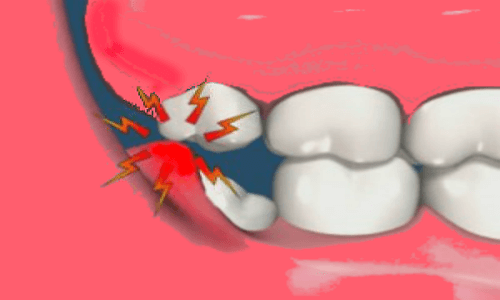 How To Cure Wisdom Tooth Infection Fast? A dental disorder known as pericoronitis, the gums in this condition gets swollen and infected in the area of wisdom tooth. Some people say it as wisdom tooth infection.It is developed from pericoronotis. The tooth erupts from the gums. When it erupts then allows bacteria to enter the gums and causes infection. Food and plaque is attached to teeth for the patients having pericoronitis. The food can also reach the flap of gum. The gum is irritated by the food that is present under the gums. In severe conditions, infection can grow and reach the jaw, cheeks and neck. Some of the important symptoms of pericoronitis are; infection, pain, swollen gum tissues, bad taste of mouth, swollen lymph nodes in the nodes and difficulties in opening the mouth. The dentist examines the wisdom teeth properly and checks how they are coming out. They determine if the teeth are properly erupted or not. An x-ray is used for determining the alignment and arrangement of teeth. Symptoms like swelling and infection are noted by the dentist. The existence of gum flap around teeth is also indicated. If the pericoronitis is present only in the area of tooth and pain and swelling are also limited to that area, warm water can be used for rinsing mouth and eliminate the problems of pain and swelling. Antibiotic reactions can only be treated by dentists. Penicillin can be used for reducing pain. Other pain killers include; aspirin, acetaminophen and ibuprofen. A pain medication is also prescribed by the dentist. Severe pain and inflammation can cause harmful effects and chances for recurring of pericoronitis. Gum flap can be removed by oral surgery. Pain and inflammation can be reduced by using low level of laser. Sometimes there is not enough space for the teeth to erupt. Incomplete eruption can cause flap of gum tissues around the teeth. The food gets trapped in gums that must be removed. The trapped food can develop bacteria. Pericoronitis can be prevented from developing by brushing and proper flossing. Flossing will remove all food particles from the mouth that could develop bacteria. In severe cases only flossing and brushing is not helpful. Flap of gums tissues are needed to be removed in those cases that could be done by a dentist. In minor cases there are chances for flap of tissues to re-grow. It is sometimes tricky to treat pericoronitis. In order to remove flap of tissues the eruption of impacted teeth is necessary. After removal the area is cleaned thoroughly by the dentist. Water is used for rinsing the area properly. The water eliminates the remaining food particles from the mouth. 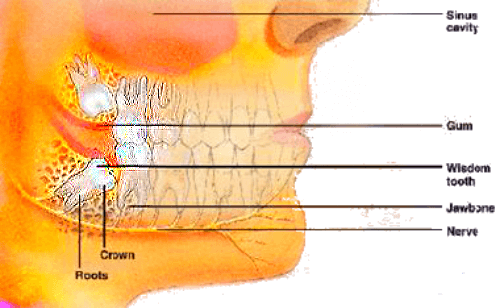 For proper eruption dentist sometimes cut the gums from below and above to create more space so eruption becomes easy. The symptom of pericoronitis must be treated as early as they develop. Any delay in treatment can spread the infection to other parts of the mouth. It can create long term effects if not treated at proper time. Dentist cannot handle the situation if the infected teeth erupt in the mouth completely. So if you have wisdom tooth infection, go to your nearest dentist as soon as possible. That video might help you to understand well, How to cure Wisdom Teeth Infection in no time.